Welcome to Kirk Erectors Inc. There is a difference. Kirk Erectors is a full service cooling tower provider within petrochemical, refineries, power plants, pulp & paper mills, steel, and food industries throughout North America. 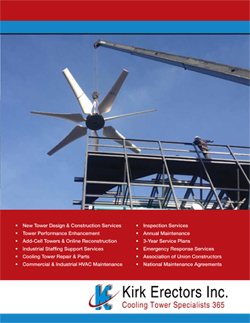 Our management team and skilled union labor forces have worked on all brands of cooling towers from reconstruction, maintenance and new tower construction nationwide. This nationwide experience enables Kirk Erectors to design, reconstruct or upgrade your existing towers with today’s technology and materials coupled with our proven safety record and quality workmanship.